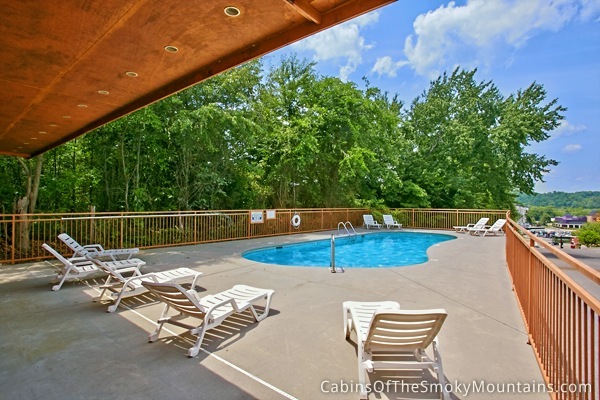 Pigeon Forge Cabin "Smoky Mountain Retreat"
Can you enjoy Pigeon Forge cabin living and still be in walking distance of the action on Parkway? 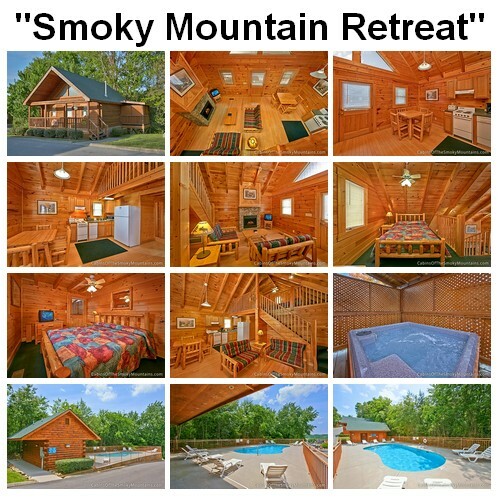 With Smoky Mountain Retreat cabin you can! 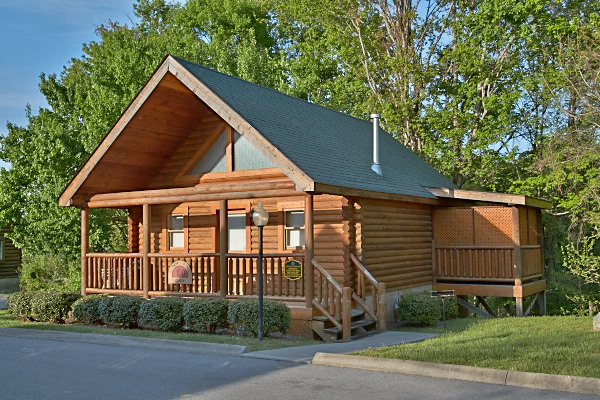 Located just off Parkway up the hill in Pin Oak Resort, this 1-bedroom cabin offers its own hot tub on the back deck in the trees, with the resort swimming pool close by, and a great deal of convenience! 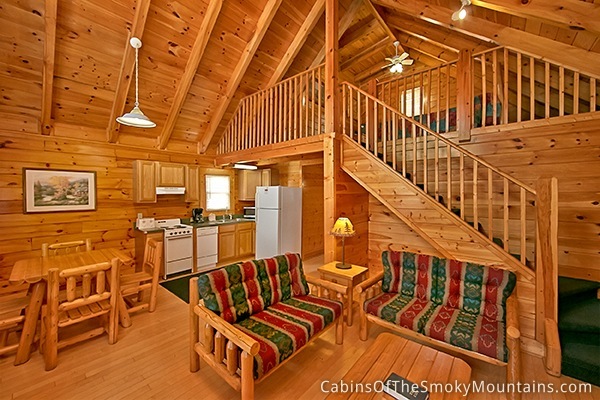 Smoky Mountain Retreat has one master bedroom leading on to the deck and hot tub, but sleeps four in comfort, with two full bathrooms, and an upstairs loft with a full bed. A couple or a small family are the perfect guests in this simple, perfect cabin. If like many people you’re coming to Pigeon Forge to enjoy the fun and excitement of the town and nearby attractions, you’re probably content just to revel in the mountains all around you, immersed in the Smoky Mountains everywhere you turn, while you get on with the fun part. If you brought the kids, WonderWorks is just across Parkway, and Hatfield & McCoy’s dinner show theater. If you’re spending the day at Dollywood, it’s no more than a short drive away. From the cabin you could walk to the river, or take the trolley up and down Parkway, taking your pick of attractions. And if by chance you’re here to get married, or to renew your vows, the Titanic Museum is actually in walking distance too, close to your honeymoon cabin. Alternately, if you’re here for the roaring fun of Rod Run, when Pigeon Forge fills up with masses of people and muscle cars cruise the strip half the night, you can forget finding parking or being able to drive anyway. That’s when you want a Smoky Mountain Retreat. People come to the Smoky Mountains for many reasons. At one end of the spectrum there’s the total wilderness experience, and at the other there’s the action in town. 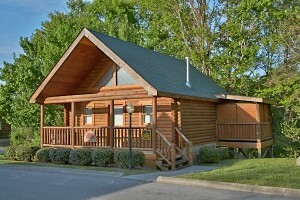 Smoky Mountain Retreat is definitely at the town end, and may even be the closest to Parkway of all our cabins. Always remember to call us to discuss the exact adventure you’re looking for. Needs vary, and with over 400 cabins to choose from, we can find you the one that’s perfect for you. Phones are open 24 hours at 855-84-CABIN (855-842-2246). No matter how close to town you want to be, you can’t beat cabin living. There’s no lodging to compare with having your own place, with a deck and hot tub, simply watching the trees sway in the breeze, or closing the door on all the bustle, dining indoors and snuggling by the fireplace, all in your own world. Smoky Mountain Retreat gives you that world, and the best of both worlds. Click here to check availability and book Smoky Mountain Retreat for your next trip!